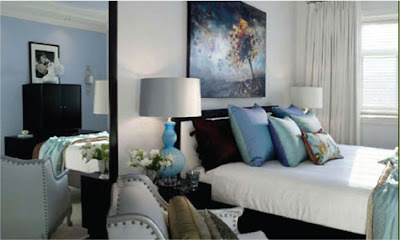 Not much has been written about the merits and sheer magic of using mirrors as focal points and works of art in rooms. So I would like to dedicate this post to the beauty, genius, and magic of mirrors. Everyone has either seen or heard of the famous Hall of Mirrors in the Palace of Versailles, built by Louis XIV in 1678. The principal feature of this famous hall is the seventeen mirror-clad arches that reflect the seventeen arcaded windows that overlook the gardens. Each arch contains twenty-one mirrors for a total of 357. In the 17th century, mirrors were among the most expensive items to possess and at the time and the Venetian Republic held the monopoly on the manufacture of mirrors. The expense in manufacture of mirrors has come a long way since those days. One of the places in a home most adorned with a mirror, other than the bathroom, is over the fireplace. It is the perfect focal point in a room to strategically place a mirror. 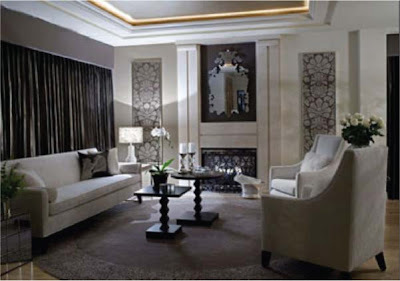 Depending on the room and the orientation of the fireplace, a mirror hung over the fireplace can reflect other important areas of the room and create drama and atmosphere. In the living room below I used a laser cut mirror above the fireplace, which echoes the filigree pattern in the framed wallpaper panels on either side of the fireplace. I painted the wall behind the mirror a deep chocolate brown to further define the edges of the mirror. The curtains are the same rich chocolate brown color and are made of silk taffeta which further adds to the shimmery effect at night. Bathroom mirrors come in every size and configuration. In my designs I try to come up with something unique, while still being very functional. In this bathroom my client wanted a 3 Way mirror. So handy if you want to get a 360 degree view of yourself. The mirror over the vanity is double sided circle, that echoes the shape of the matching back to back sinks. The mirror is attached to the ceiling and to the vanity at the top and bottom with clear glass. What do you do if you have a window in front of your vanity? Below in my own bathroom I used California shutters for the window covering. I love the look and feel of California shutters. I designed the room so that the sink was centered on the length of the window. I had the stile of the shutters made to line up perfectly with the center of the sink, then I had my glazier design a special mounting that would allow the mirror to be attached to the stile, while still allowing the shutters enough space behind the mirror to open and close. The mirror appears to be floating in front of the shutters. The mirror I designed and had built for my client's dining room. 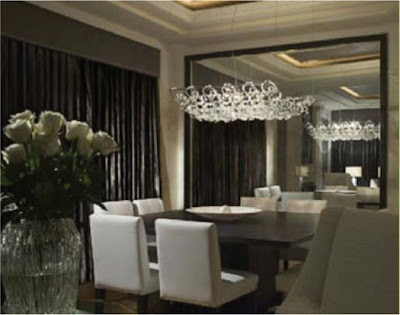 It perfectly reflects the magnificent Murano glass chandelier hanging over the custom built large square dining table. It also captures views of the adjoining living room for people that are sitting with their backs to it. When you are making mirrors this large make sure that they will fit through the front door. I made that mistake once and that was enough to learn a very valuable lesson: check and double check every detail!! If it still won’t fit, I have the mirror made on-site. The draperies are made of chocolate brown silk taffeta with a padded valance, the ceiling inset is lit around the perimeter and painted with gold leaf. In this bedroom I placed a full height mirror for the client to use as a dressing mirror. Post Script Oct 30 2008 Gray bird photo is actually a Gray Jay otherwise known as a Whiskey Jack. What's in a name? Well our First Nations people knew this creature as "wiss-ka-tjon" or "wis-ka-chon". In the old-time lumbering days the Jay would visit the lumberjacks in the northern forests of Canada. In turn, the lumberjacks shared their grub with it and came to call it "Whiskey-Jack". Now the bird's modern "common" name is "Gray Jay" or "Canada Jay"(and its scientific name is Perisoreus Canadensis). following Ivan's posting of his interview with me. The note on the orchid said "Thank-you so much for the Interview" Ivan Meade. published in Architectural Digest, House and Home, Style at Home, Western Living along with other notable magazines. Iván Meade - What was your first experience with design? Patricia Gray - When I was 5 years old I remember rearranging the furniture in the Living Room. basically open your personal life to the web? good forum to express myself outside of my professional practice as an Interior Designer. It has now taken on a life of its own. Iván - What has been the best experience of being a design blogger? New York. My readers are from all over the world and are very sophisticated and savvy. They keep me on my toes. Iván – Your interiors definitely celebrate restraint and order. To what/whom do you owe this influence? 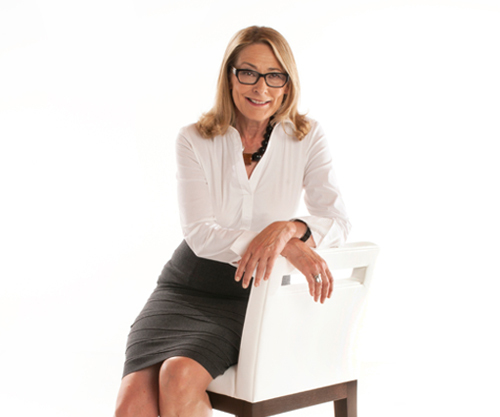 Patricia – My Professor, Terry Kutcher ,when I was a student in Design School inspired in me a love for design. was at the time creating designs that were new and innovative and were totally suited to the times. also very livable. How do you archive that? don’t appreciate any one thing in particular. Also important in editing is the details. They have to be executed to perfection. Iván - It’s the big installation day. What could have gone wrong did go wrong. How does Patricia Gray deal with that? 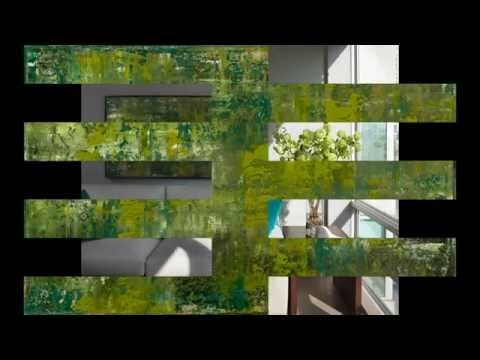 show, how would you educate the viewers about interior design? to follow a project week by week to completion. 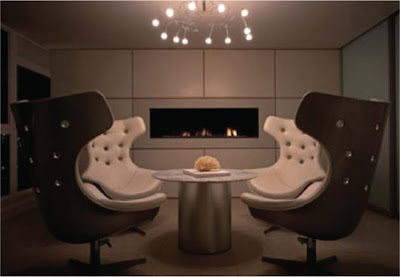 Iván – A decor fad you hope never to see again? a new generation comes along and loves the things of the past and breathes a new life into it. top design in the world right now is coming from this country. Iván - Any words of wisdom? around you that you love!! 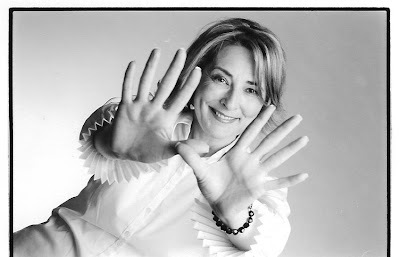 Patricia – That I created spaces that were memorable, stimulating to be in, and stand the test of time.